We've just finished up a the high speed water droplet workshop this afternoon. This is one of my really popular workshops as the results are always beautiful. Below are two of the images created by students during the workshop. I'm not going to go into depth about the creating these images as there are a number of articles on the internet that are easy to access and basically cover just about everything there is to know about water droplet photography. Corrie White, whose flickr galleries make for some inspirational viewing, practically made a profession out of photographing water droplets. Articles like those DIY Photography and Kevin Lewis have created are a fantastic way to get to know the basics and run from there. Then there's the incredible imagery by Jaroslav Wieczorkiewicz that defies reason with clothing made of milk and water. 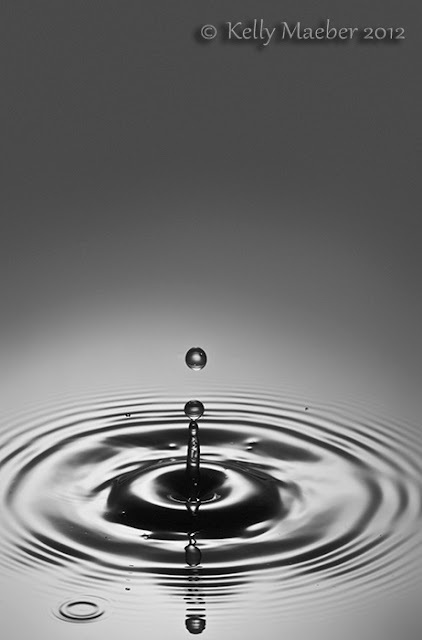 These images use the same principles as those in the far simpler water droplet photographer. He just takes the technique to a whole new level. I can point point a few basics though. For a start, water photography is a little like shooting glass. You light the background and use the reflective properties of the water to create definition. It's possible to point the light directly at the droplet, but it's far better to point it towards the background. The other interesting thing is that a black water tray works a lot better than a clear one. This is again because of the reflective properties of water. The light tones in these images are from the reflection of the backdrop (in the coloured image we shot through a semi-opaque perspex with gelatin filters attached to the flash - an SB-800 triggered via a Phottix Stratos II). If you don't have a black tray you can also line a tray with a black garbage bag (as we did). Just make sure tio smooth out the plastic as much as possible. Then there's the viscosity of the liquid. Milk has more viscosity than water, which is one of the reasons why so many droplet photographers use it. You can start to get some of that viscosity in water if you use gelatin though. Ordinary food grade gelatin can be mixed into your water and suddenly you'll find your drops are more defined with better running tendrils when you are creating coronation patterns. Last off of course is the lights. A standard manually adjustable hot-shoe flash is ideal for this type of photography. Just remember that the shorter flash durations occur at lower outputs (flash set to 1/8 or 1/16). The flash burst is really a pulse of light. The more powerful the burst, the longer the pulse. Less power = briefer pulse.